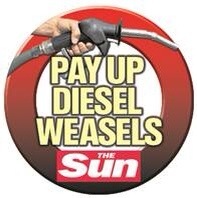 The Sun – Britain’s biggest national newspaper, reaching over 6 million readers each day – has today launched a campaign for compensation for the millions of drivers seduced into buying diesel cars – and who now face large fines as a result. Almost 11 million people have been persuaded by successive governments to snap up the “greener” vehicles since 2001, when then-Chancellor Gordon Brown increased excise duty for petrol cars with higher carbon dioxide emissions — making diesels a comparative bargain. The number of diesel car owners in the UK has rocketed from 1.6 million to 11 million in the space of a decade. But major cities are now planning to punish diesel drivers with a £10-a-day tax because of other killer fumes which are linked to the fuel. A move to add a diesel-levy on the congestion charge was unveiled by London Mayor Boris Johnson last month following Britain’s failure to meet air quality targets set by the European Union. Almost 460,000 lorries, 3.3 million vans and ten million cars could expect road charge hikes unless they upgrade to newer “Euro Six” diesel vehicles. Drivers whose motors fail to comply could also face lower resale values. Today The Sun is calling on the Government to compensate motorists seduced into buying diesel vehicles, by opening a scrappage-style scheme aimed specifically at such cars. The Sun proposes that drivers should be given £2,000 towards the cost of a new motor that meets environmental standards — and will not face fines in the future. Motoring groups yesterday backed the scheme, which would be similar to the scrappage initiative launched in 2009 to boost the car industry. “Scrappage was incredibly successful for cars and quite revenue-neutral due to its effect on the new car industry. A scrappage scheme could also target the gross polluters.” Road Haulage policy director Jack Semple said: “If the emission standards are not delivering, that’s not the fault of the Mayor of London. The Car Scrappage Scheme was introduced in the 2009 budget to aid the economy and environment. The Government agreed to provide £1,000 towards the purchase of a new car from participating dealers. Manufacturers also knocked £1,000 off the list price. Almost 400,000 cars were bought under the scheme. This is ridiculous first they build diesel car attract us to drive more mileage then fine us to drive them.